The Irvinestown official stunned the Bannsiders by altering his decision after awarding a 67th minute penalty kick when Jamie Glackin was chopped down by the lunging boot of Sean Ward. He immediately pointed to the spot, but after consultation with his assistant on the line, Richard Storey, he awarded a free kick inches outside the box. It was a decision the sucked the life out of McAree’s side, who at that stage, were pushing for an equaliser after David Cushley has shot the Crues into the lead from the spot when the flying Paul Heatley was hauled down by a desperate challenge from Aaron Canning. 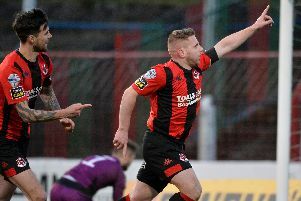 McAree was of no doubt that Marshall’s decision to deny his boys a ‘stonewall’ spot kick altered the dynamic of the game. “The financial fall out from this is massive,” said McAree. “Our target from the outset is European football – that incident it could end up costing the club close of £250,000. “It hurts a lot of people... people to put in a lot of work into the running of Coleraine Football Club. It’s criminal and it has crucified. “You expect officials to get decisions right at this level – he was only yards away from the incident. Between the referee and the linesman, they have made a hash of it. McAree is adamant Glackin was pulled down inside the box, which television footage would suggest. He went on: “It was a penalty kick all day long. My recollection of it was the referee was in a good position, better than his assistant. “He’s the senior referee and he’s the long looking at it for a closer distance. The linesman decided he would overrule Tim. At that stage, such was the magnitude of the decision, he had to make sure he got it right – he had to be 100 per cent sure. Coleraine must now rely on the end of season European play-off’s to plot a way to European football. “A lot of people will suffer because of it,” added McAree. “The players, first and foremost, the staff will suffer, the directors and the club. We were not guaranteed to win the game, but we would have given ourselves a better chance. “Had we scored, it would have been one-each. I thought we were in the ascendency at the time . . . I thought we were the better team. We could well have gone on to win it. Who knows?